My day job has me commuting by train 2 hours a day plus about a hour’s worth of getting to and from the office and the train station. Some mornings, when the wifi works and I can get a seat, I’ll work on the way into the office, clearing emails and going over pull requests. Sometimes I can even write a little code. In the afternoons I rarely get a chair until the latter half of the train ride and have little inclination to continue work. I try to use this time well. I read. I read Mark Twain’s “Life on the Mississippi“. I burn through my podcast feed. But I hate that I don’t get home at a reasonable enough hour to do something creative with my time. So I bought an iPad Pro and an Apple Pencil. I waffled hard about wether to get the giant-sized 12” iPad Pro or to get the “standard sized” iPad Pro. After much deliberation I chose the smaller model. With a high resolution display and pinch-ey-zoom-ey technology the screen size doesn’t matter that much. The 12” model is quite a bit more expensive, while the standard size has a much better display. Apple calls this a “True Tone” display - basically this iPad carries onboard ambient light sensors and can adjust the color gamut of the display to the room. This is something magical. It’s like suddenly discovering that the oil painting of a landscape in the library is actually a window. The effect is subtle, and hard to describe. Everything looks correct. Also recall turning on your phone in a dark room and feeling blinded. Now imagine that doesn’t happen because the display knows how bright to be and what color to be. For artwork, this is amazing. Correct color everywhere. The Apple Pencil works very very well. It’s heavy. It’s responsive (it’s not truly instantaneous, but it’s faster than any other stylus on the market. Yes, even that crazy tilt-a-wheel PC from Microsoft). It’s nice. So with a Pencil and a cover and a base model 9.7” iPad Pro I am about $800 poorer. But now I have an unlimited supply of paint. There is no real competition for drawing / painting apps for the iPad. 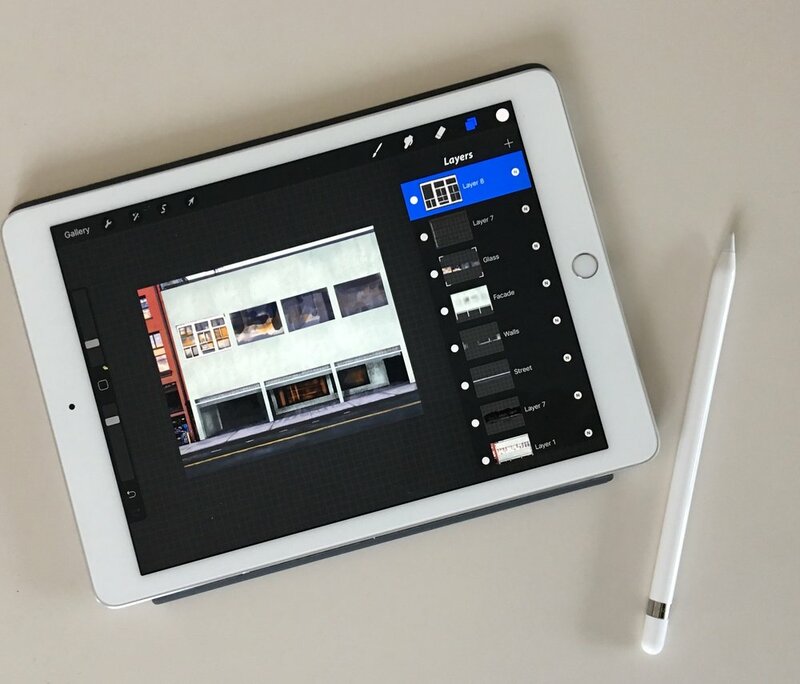 Autodesk’s various Sketchbook apps are nice, but don’t compare to the natural, dynamic quality of Procreate. “Paper” is ostentatious junk. Adobe’s offerings are embarrassing. Procreate is easy to learn. The incredible depth of the app exposes itself over time. But a child could pick it up and make something immediately. Truthfully my decision was clinched in the store by drawing a portrait in 10 minutes in the store with no real practice. Procreate is $4.99 in the App Store at the time of this writing. If I could I’d buy it twice. My fist “serious” attempt at making an image in Procreate involved my ‘painting’ over the top of a photograph which I took and imported. This works well. But it would be nice to have a means to “float” an image on the screen (perhaps using iOS’s Picture in Picture feature?) for those times when you want to refer to an image but not work into or on top of it. I have found that I can solve this problem by taking advantage of the iPad’s newer side-by-side two apps at once feature. I can open Photos on the right, and keep Procreate on the left. This is where a giant screen iPad would come in handy, but frankly a floating reference photo feature would be far better. Some days, when I commute, I walk downtown to catch the streetcar and take the streetcar to the train. Across from the streetcar stop on Commerce Street is an odd, green building. Downtown Tacoma tumbles downhill to the water - so the building I see by the streetcar is the back facade of a building which probably has a Broadway address. The front is two stories, the back is four. The bottom floor holds a creepy garage and always seems abandoned at 7am. The morning sun strikes the green wall head on and reveals its age and wear. I pained this in about 8 total hours with Procreate. I had some false starts while learning to be precise and to create certain effects. With the pencil, painting is so natural it’s all too easy to forget that you’re painting on a computer and you can take advantage of amazing concepts like copy and paste. The art-school graduate in me has concerns. Is this “real”? Does it count? Painting digitally is embraced by designers, concept artists, and illustrators. But I bet if you walked into your favorite local art gallery they’d chuckle if you asked them about digital art. Would Rafaël Rozendal chuckle? 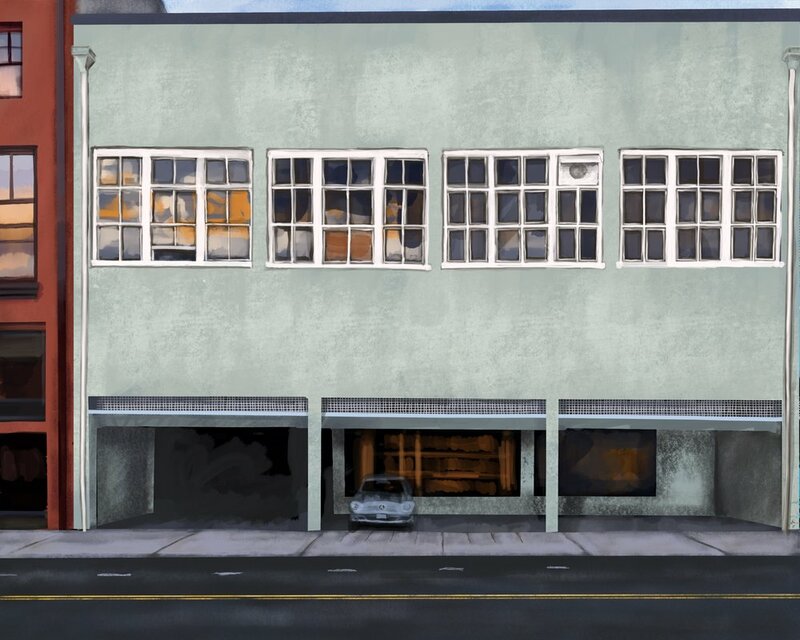 If I projected a digital painting and animated it across a building would that help it to transcend to “new media“ art? It doesn’t really matter of course. But indoctrination is powerful. I still bristle at stupid conversations I had with faculty in my graduate problem who had a problem with my using a computer to generate images. But then again. Those guys (and it’s always guys) had a problem with photography.